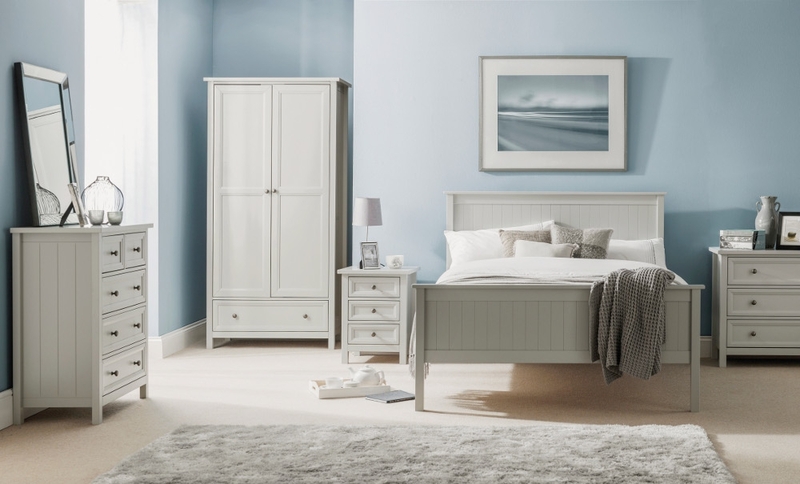 If you are looking for a superb wooden bedroom collection then the Maine Dove Grey Range should be one of the first to consider. The soft dove grey colour will match with many different bedroom colour schemes and be suited to many different styles of home. All doors and drawers in the range feature a matching bevelled design with pewter handles. The Maine Bedroom Furniture Collection features an array of different bedroom storage options meaning you will be able to find the right balance between having enough storage space and having space to move in your room. There are two wardrobes in the collection, a medium sized 2 door and 1 drawer wardrobe and a larger 3 door with 2 drawers should you require the extra storage space and have enough room in your bedroom or dressing room. Chests of drawers are very handy for underwear, towels and other bedroom items; however, some bedrooms feature small alcoves or a slanted ceiling which means that the roomset you have set your heart on might not fit. The Maine steps in though where other ranges fall down as there are 4 different styles and shapes of drawers include a narrow 5 drawer chest and a wide 6 drawer chest so you can be sure to find the right pieces of furniture for your room.